Tales of Mean Streets (1894) describes the contents exactly — the meanness not only of city and streets but also of characters and the poverty that confines them. These, I think, are stories written by a man who escaped such poverty and looks back on it only with relief that he managed to get out, and perhaps with a fear of falling back that erases generosity. There is none of the lurid and titillating violence and detail of Thomas Burke, nor yet any of the humour, pride and everyday mutual support seen in W. Pett Ridge. Just poverty, meanness, narrowness and desperation. In such depths of poverty these things exist, of course, in abundance. I hate when they are not balanced by the small things that still make lives bearable, humour above all, but I know that fear of poverty not just lying behind you but also lying in ahead and how it can shape your view of the world. These are tales of the working class by one of their own like those of Pett Ridge, and on the same subjects from Edwin Pugh, Somerset Maugham (whose work mostly infuriated me), and Richard Whiteing. All of whom together came to be seen as a new school of English fiction as stated by the introduction on Morrison’s life and work. I found another list of Victorian ‘slum fiction‘, which includes all of these titles and many more. 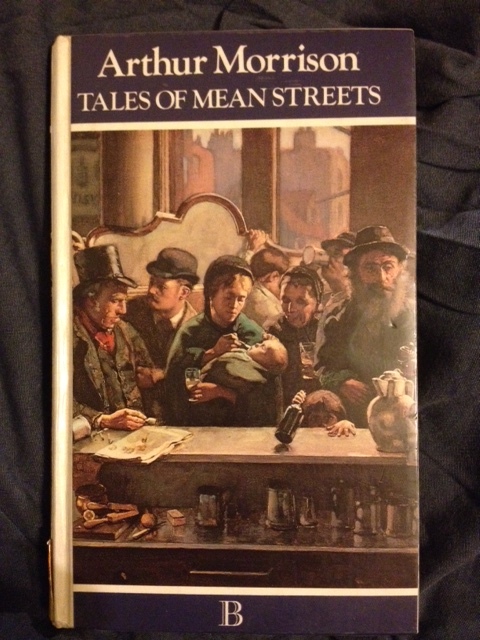 For a taste of daily life, a sense of the streets, Tales of Mean Streets is very good. The stories, too, are beautifully crafted. Always a hidden ugly little twist to make them stand out as far more than just descriptions of everyday life and struggle for survival. This is not surprising given the company Arthur Morrison kept — though that company was surprising. He worked for W.E. Henley, editor of the National Observer… who was on the crack team of writers forming his team? In addition to Morrison there was Rudyard Kipling, J.M. Barrie, Thomas Hardy, Charles Whibley, H.G. Wells, W.B. Yeats and H.D. Lowry.I can’t imagine them all just sitting in the pub after work, but I am enjoying the effort. Morrison worked under Walter Besant on the newspaper at the People’s Palace in Mile End, which endears him to me immensely. He left to become a writer and journalist, wrote detective tales starring Martin Hewitt also published some tales of the supernatural in Cunning Murrrell (1900), and his more famous works, A Child of the Jago (1896), To London Town (1899), and Hole in the Wall (1902). This street is in the East End. There is no need to say in the East End of what. The East End is a vast city, as famous in its way as any the hand of man has made. But who knows the East End? It is down through Cornhill and out beyond Leadenhall Street and Aldgate Pump, one will say: a shocking place, where he once went with a curate; an evil plexus of slums that hide human creeping things; where filthy men and women live on penn’orths of gin, where collars and clean shirts are decencies unknown, where every citizen wears a black eye, and none ever combs his hair. The East End is a place, says another, which is given over to the Unemployed. And the Unemployed is a race who token is a clay pipe, and whose enemy is soap: now and again it migrates bodily to Hyde Park with banners, and furnishes adjacent police courts with disorderly drunks. Still another knows the East End only as the place whence begging letters come; there are coal and blanket funds there, all perennially insolvent, and everybody always wants a day in the country (19). Of this street there are about one hundred and fifty yards–on the same pattern all. It is not pretty to look at. A dingy little brick house house twenty feet high, with three square holes to carry the windows, and an oblong hole to carry the door, is not a pleasing object; and each side of this street is formed by two or three score of such houses in a row, with one front wall in common. And the effect is as of stables (20). There follows a categorisation of who lives on such a street, not noisy, loud troublemakers marching to Hyde Park or factory girls living a little further out of the city, instead on this street are the people too proud to ask for charity, the men work in the docks or the gasworks, maybe the shipbuilding yards. Two families live in each house, possibly a lodger. And then a description of the mayhem, the waves of male workers, school children, children carrying their fathers lunches down to the docks or gasworks, their return, the return of the men. Every day except Sunday. Yet there are aspirations. There has lately come into the street a young man lodger who belongs to a Mutual Improvement Society. Membership in this society is regarded as a sort of learned degree, and at its meetings debates are held and papers smugly read by lamentably self-satisfied young men lodgers, whose only preparation for debating and writing is a fathomless ignorance. For ignorance is the inevitable portion of dwellers here: seeing nothing, reading nothing, and considering nothing. From this street all of the stories grow, as much as anything can grow in the environment so described. Everything stunted, petty, brutal mean. For many there is some compassion from the author — distinctly in contrast with lack of compassion and the hatred of anyone getting above themselves from the rest of the neighbourhood, which often hastens their brutal end. In the midst of the riot the decent woman sat silent and indifferent, her children on and about her knees. Further along, two women ate fish with their fingers and discoursed personalities in voices which ran strident through the uproar, as the odor of their snack asserted itself in the general fetor. And opposite the decent woman there sat a bonnetless drab, who said nothing, but looked at the decent woman’s children as a shoeless brat looks at the dolls in a toyshop window. This is also noteworthy for use of one of my favourite words ‘stramash’, meaning fight. I always thought it was scottish, but perhaps was once as common down South? ‘The Red Cow Group’ describes an eager young anarchist (I am fairly certain police provocateur along the lines of The Secret Agent) willing to teach men how to make bombs and tell them where to put them but loathe to do anything himself — he is demolished in the most satisfying way by a group of working class boozers. Mrs. Napper went that very evening to the Grove at Stratford to buy silk and satin, green, red, and yellow–cutting her neighbors dead, right and left. And by the next morning tradesmen had sent circulars and samples of goods. Mrs. Napper was for taking a proper position in society, and a house in a fashionable part–Barking Road, for instance, or even East India Road, Poplar; but Bill would none of such foolishness. He wasn’t proud, and Canning Town was quite good enough for him. This much, though, he conceded: that the family should take a whole house of five rooms in the next street, instead of the two rooms and a cellule upstairs now rented (131). There are stories that show the desperation of the great Dock Strike of 1889, the promise of boxing as one way of escape, the mix of the criminal and the decent, the explosiveness of violence and the pervasiveness of poverty. I wonder what it was exactly that brought Morrison back to to write these stories.